Well, Christmas has been and gone, and we're into a dull, grey January. It's so grey I can't bear to take down all the fairy lights so I expect they'll remain where they are for the full twelve months, or until we need to take them to a festival (we start those in May, so it's not that long to wait). I made hats for my Mum for Christmas, she only asked for one but the boredom of knitting 'something to match her navy blue coat' was so difficult to cope with that I ended up making three, two of the same pattern - and it really does show how you yarn choice can make an item a very different item to the other one (if you follow) and another which was SO BEAUTIFUL I almost kept it for myself. They are all patterns from Woolly Wormhead, 'hat architect' extraordinaire. Now, this is a lovely design, simple and effective (as you will see, and can see from the purple hat in the published pattern) and an easy knit for in front of the TV on a wintery afternoon. 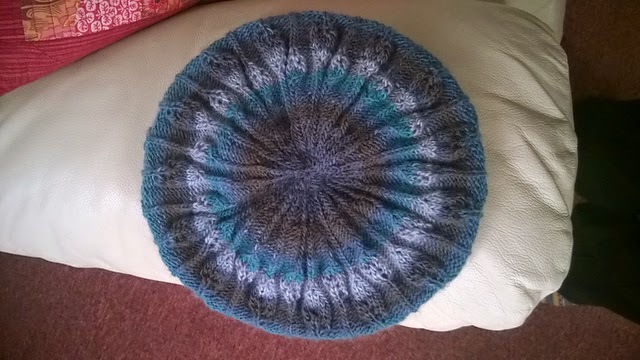 But this dark blue flat looking yarn turned it into what I can only describe as a 'school hat', which does match the coat so, brief fulfilled! Same design, completely different hat experience!. I had a few doubts about the colourway on this as I knitted it (pink/green/very dark red may not be to most people's taste after all) but the finished item shows it off really nicely (unlike these slightly shoddy photos). What a wonderful thing this is. I really avoid knitting anything lacy as a rule, I don't enjoy it, it makes me incredibly tense and the chiropracter is not cheap so if I do it's generally a small item such as hat or gloves. But I found this one endlessley entertaining - watching the 'candle flames' appear (I was in a fairly seasonal mood by this stage) was really quite engaging. The stripes actually work quite well and the yarn is beautiful. the only thing I had to drink through was the 1 x 1 twisted rib, but it does look fantastic, so was worth it.